Organizing and planning a wedding is a very long process. The work involved is very time consuming and can sometimes be very overwhelming. Below is a wedding planning checklist of some of the things you will have to do in order to properly plan your wedding. 1. 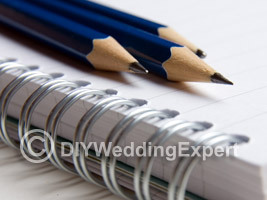 Start a wedding binder for all your important information. Keep this list pasted on the inside cover for reference. 4. Start a wedding guest list. 5. Hire a wedding planner if you have decided to do this. 6. Reserve your dates and ceremony and reception venues, whether they will be in the same place or different. Book your officiant. 7. Do research and begin interviewing photographers, entertainment, florists and caterers. You should book these within eight to eleven months prior to the wedding. 8. Purchase the wedding dress and veil. Three fittings are normal for a wedding dress. Plan accordingly. 9. Your out of town guests will need to stay somewhere. Reserve a block of hotel rooms at three different hotels for them. 10. Register your wedding at three different retail outlets. Pick out those gifts you most want. 11. Purchase and mail your invitations. 13. Have your bridesmaids shop for their dresses. Six months prior to the wedding is the normal time allotted for this. 14. Arrange for your limosine or minibus or town car. 15. Book the rehearsal and dinner venues. 16. Order your wedding cake. Also think about the Groom’s cake you may want. 17. Schedule hair stylists and makeup artists. Decide who will be having this work done on the wedding day, bridesmaids, mother of the bride, mother of the groom. 18. Choose the music you want played at the reception. 19. Finalize all plans with all vendors. 20. Order your favors or begin making your own as soon as possible. 23. Purchase wedding party gifts. 24. Assign seating for the reception. 26. Write your vows, if you have decided to do this. This is a quick wedding planning checklist that you can keep with you at all times when you go through the entire process.